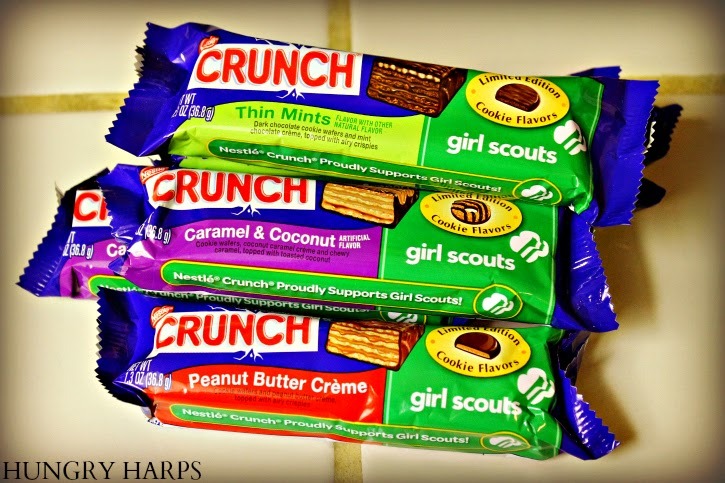 Nestle has recently released a Limited Edition candy bar that had me racing heading straight to the store - Girl Scout Crunch Bars. Let's just take a moment and talk about this. First off, I was a Girl Scout - so the name sparked my interest. I spent hours of my childhood hawking Girl Scout cookies out in front of the grocery store. It may not sound like fun to an adult - but it was so much fun as a kid! It gave me a forever-bond with Thin Mints, Samoas and Tagalongs. :) Second - Nestle Crunch Bars were my favorite candy bar as a child, so I am already game to try any variant that they release. These Nestle Girl Scout Crunch Bars are like memories from my past being mashed together and sold at the stores in the cutest packaging. 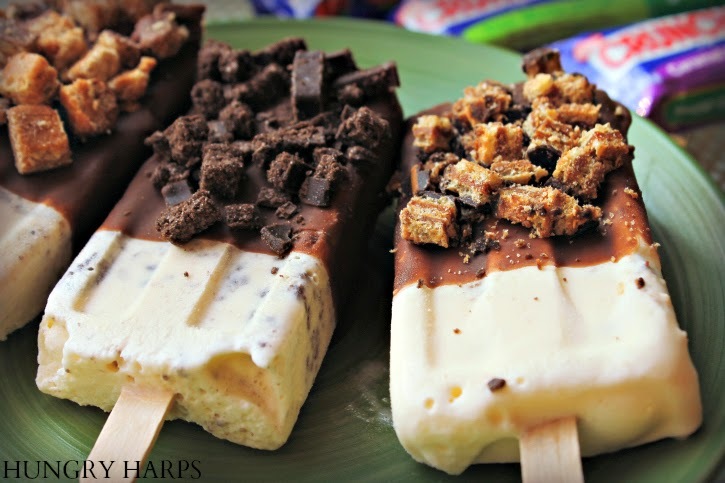 Since the weather has been ridiculously hot lately, I am talking 109 degree weather, I decided to make some Nestle Girl Scout Crunch Ice Cream Bars. So glad I did because not only is this recipe super easy to make - I didn't have to turn on the oven. B-O-N-U-S. 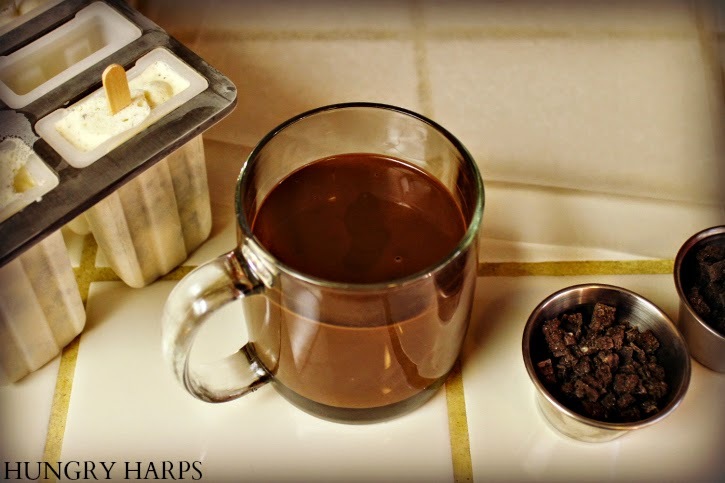 The word easy can be thrown around when describing a recipe - but this is seriously easy. I would go as far to say that these would be a good recipe to try with a Girl Scout troop. Oh, and if you are wondering about the taste - I can firsthand tell you that they are great! 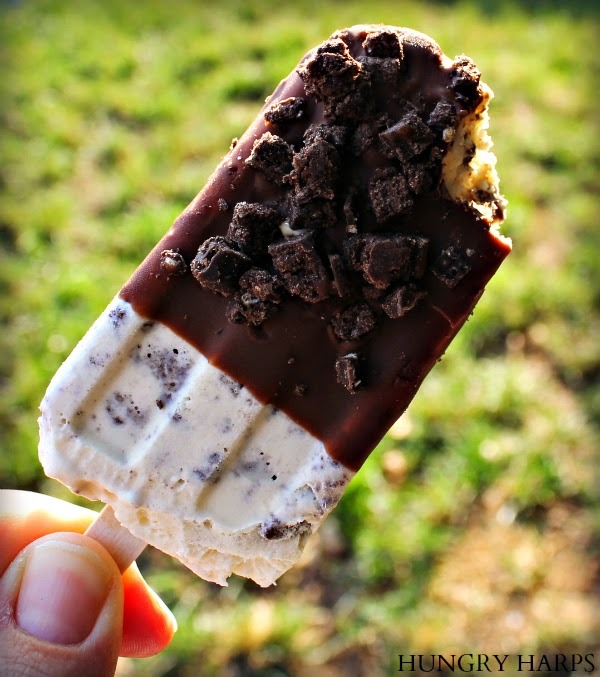 The ice cream is soft, yet firm and the chocolate coating with candy pieces is crunchy and delicious. 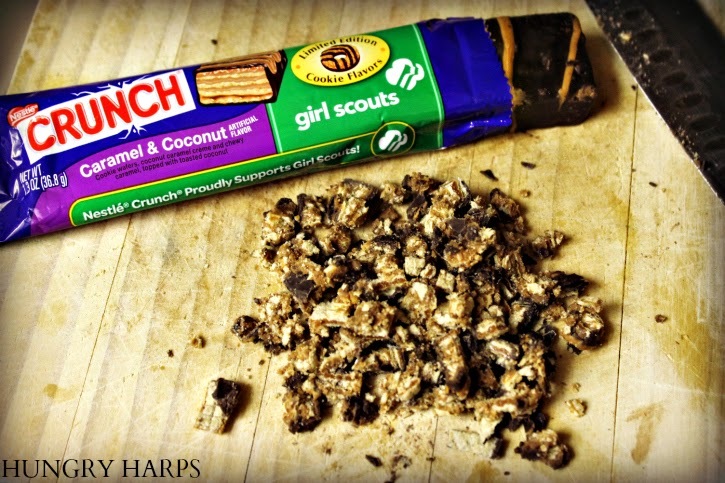 And if you are not sold on making these yet - you only need 3 ingredients: Nestle Girl Scout Crunch Bars, Vanilla Ice Cream and Magic Shell. 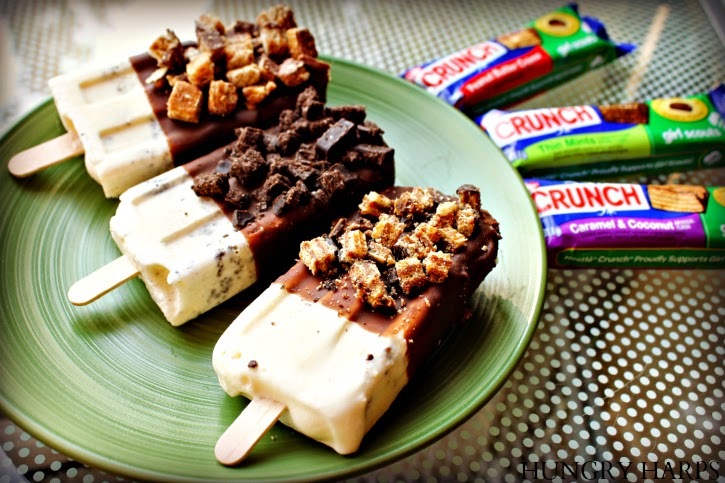 Haha, seems like I may be hawking these Nestle Crunch Ice Cream Bars like I did with the Girl Scout Cookies.. Here's how easy it really is! Second, mix chopped up pieces with softened vanilla ice cream. Mix it until smooth and there are no chunks of ice cream left. Either serve immediately or put back in freezer to devour serve later. 1. Chop 4 of the Nestle Girl Scout Crunch Bars - 2 pieces come to each package, so it will be 8 pieces total that you will be chopping in this step. 2. 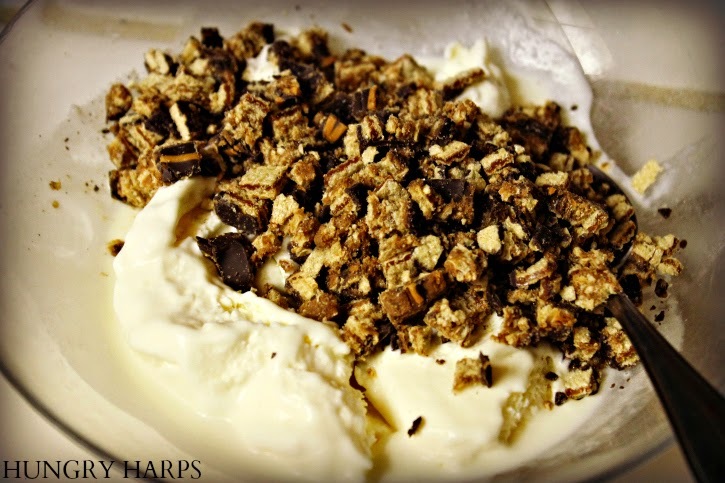 Mix candy bar pieces with ice cream until mixture is smooth. Pour into popsicle molds and freeze for at least 4 hours. 3. Chop remaining 6 Nestle Girl Scout Crunch Bars. 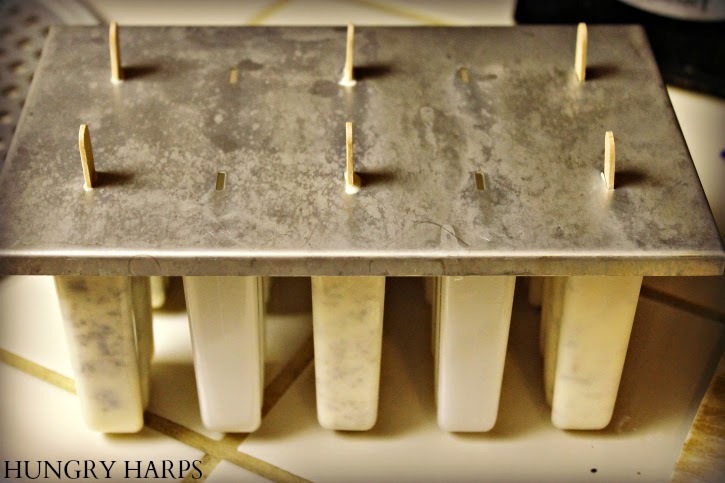 I used condiment cups to hold each chopped bar to ensure each ice cream bar would be coated with the same amount. 4. Pour entire bottle of Magic Shell into a coffee mug. 5. 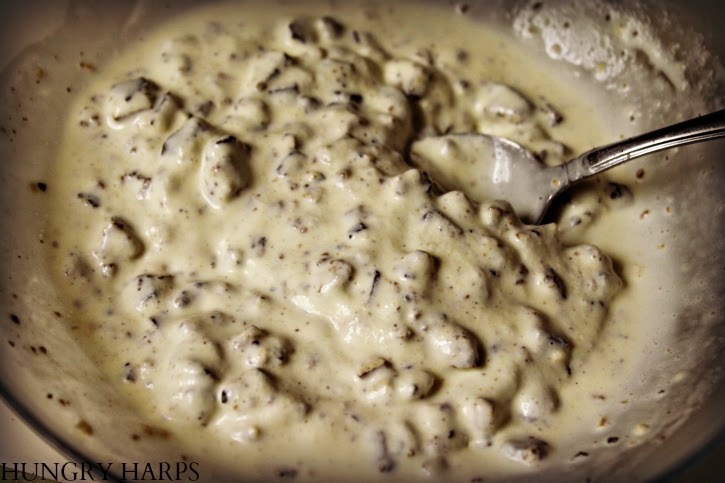 Remove ice cream bars from freezer, dip each one into the mug of Magic Shell and immediately sprinkle with chopped candy bar pieces. 6. Serve immediately or return to freezer to serve later.